NASA’s new Ares I-X rocket may be the world’s largest booster currently in service or about to fly, but it is no behemoth when compared to giant rockets of the past and, perhaps, the future. The Ares I-X rocket is poised to launch on a suborbital test flight on Oct. 27 and rolled out to its launching pad earlier this week. It stands about 327 feet (100 meters) high — 14 stories taller than NASA’s space shuttles — and is equivalent in height to its namesake Ares I. The Ares I booster is designed to launch NASA's Orion spacecraft slated to replace the shuttle fleet. “It gives you a sense of the scale of what NASA does that our flight test rocket is larger than any other rocket in the world,” Ares I-X deputy mission manager Jon Cowart told SPACE.com. But the Ares I-X and Ares I rockets are by no means the largest rockets ever built. In fact, the Ares I-X is the third tallest rocket in history behind a pair of giant boosters built to launch astronauts and cosmonauts to the moon. But there’s one future booster that could — when built — steal the “World’s Largest” title from the granddaddy rocket of them all, NASA’s mighty Saturn V.
The reigning champion of giant rockets is NASA’s massive Saturn V, a three-stage booster used to launch American astronauts to moon in the late 1960s and early 1970s. That last Saturn V was a modified version that launched NASA’s Skylab space station. Smaller versions of the Saturn rocket were used to launch astronauts to Skylab, with the last one — a 224-foot (68-meter) Saturn 1B — launching in 1975 to fly Apollo astronauts to meet a Soviet Soyuz spacecraft during the Apollo-Soyuz joint mission. A close second in the giant rocket race is the former Soviet Union’s N-1 rocket, an enormous booster designed to launch cosmonauts to the moon during the Space Race with the United States. The former Soviet Union did have other hefty rockets in its space launch inventory. The enormous D-1E and D-1 variants of the Proton used for the 1968 lunar probe missions and 1971 Salyut 1 space station launch. Neither came close to the N-1’s towering stature. Today, Russia still uses Proton rockets and smaller Soyuz boosters for to launch satellites into orbit, though cosmonauts continue ride only Soyuz rockets into orbit. The country is also developing a new family of Angara rockets. Before the rollout of Ares I-X, the tallest rocket in service in the United States' inventory was the Delta 4 Heavy, a heavy-lift version of the United Launch Alliance’s Delta 4 booster. The claim by Ares I and Ares I-X on world’s tallest rocket may be fleeting if NASA’s plan to build a companion heavy-lift launcher bears fruit. That giant rocket — the enormous Ares V — would reach a skyscraping height of 381 feet (116 meters) that would surpass the Saturn V and set a new world record. The rocket is designed to launch 207 tons (414,000 pounds) of cargo to low-Earth orbit and 78.5 tons (157,000 pounds) to the moon. Designed primarily to haul cargo, the Ares V booster is NASA’s supply truck for the post-shuttle era. The rocket consists of a giant core stage flanked by two solid rocket boosters, each slightly larger than the first stage of Ares I. A so-called Earth Departure stage and Altair lunar lander would sit atop the core stage and be launched into orbit to meet Orion spacecraft carrying moon-bound astronauts. In place of the upper stage for moon missions, giant cargo modules or even massive space telescopes could be packed away, according to a report by the National Academies of Science. NASA hopes to have the Ares V rocket in operation for manned moon missions in the 2020s. NASA’s space shuttle fleet may seem puny compared to giant rockets of the past, but its 28-year flight history makes it a good measuring stick when it comes to booster match-ups. And, of course, it depends how you measure the shuttles. On the ground, each NASA space shuttle — there are three orbiters remaining: Discovery, Atlantis and Endeavour – is about 122 feet (37 meters) long from nose to stern and stands 56 feet (17 meters) tall. They have a wingspan of about 78 feet (23 meters). But in launch position, the orbiter is perched on the side of its 15-story external fuel tank and flanked by two solid rocket boosters. A shuttle on the launch pad measures 184 feet (56 meters) tall from the tip of the external tank down to the aft skirts of its twin solid rocket boosters. The space shuttle has a 60-foot (18 meter) long payload bay that is 15 feet (4.5 meters) wide. Orbiters can haul large payloads into orbit, making the shuttle the only spacecraft capable of launching massive segments of the International Space Station, which occupied the bulk of the shuttle fleet’s flight manifest for more than a decade. NASA has launched 128 shuttle missions since the fleet’s debut by Columbia in April 1981. There have been two failures: The shuttle Challenger and seven astronauts were lost just after launch in January 1986 due to an O-ring seal leak in a solid rocket booster that led to an explosion. The shuttle Columbia broke apart during re-entry in February 2003 due wing heat shield damage. Seven astronauts were killed. NASA officials have said the new Ares I rocket, with its top-mounted capsule and launch abort system, will be orders of magnitude safer than the current shuttle design. 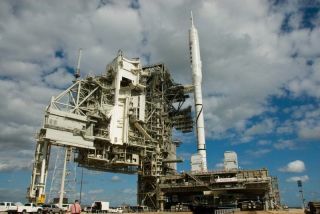 In addition to Tuesday’s Ares I-X launch test, launch abort system tests are scheduled to begin in 2010, NASA officials have said. SPACE.com Staff Writer Clara Moskowitz contributed to this report. SPACE.com will provide full coverage of NASA's Ares I-X test flight with Moskowitz in Cape Canaveral, Fla., and Managing Editor Tariq Malik in New York. Click here for full mission coverage.